Central Govt Jobs Recruitment 2019 has been announced for the below vacancies. Read the following Job Notification details to get a clear idea about Registration process, Eligibility, Qualification, How to apply, No of Vacancies, Salary, Job Location, Links to apply, Selection procedure, age limit and all the instructions before applying for this job. Click the FACEBOOK ICON below To get Alerts of All Job Notifications from WAY2TNPSC Interested and Eligible Candidates can apply before 17-May-19. Keep on reading this page to know all the above details. So, it will be helpful to know the procedure and details for the candidates who wish to apply for this particular vacancies. The Government of India often abbreviated as GoI, is the union government created by the constitution of India as the legislative, executive and judicial authority of the union of 29 states and seven union territories of a constitutionally democratic republic. It is located in New Delhi, the capital of India. It provides many Job Recruitment to People of India and make them Employed in the Govt Sectors. 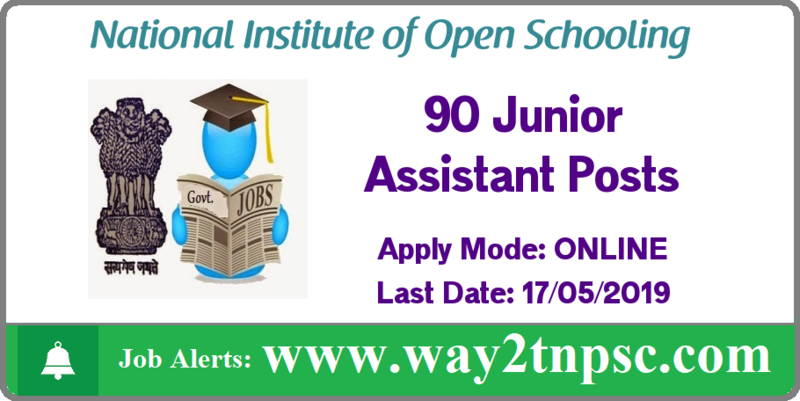 The above Notification ( NIOS Recruitment 2019 for 90 Junior Assistant Posts | Apply online ) briefly describes about the details of latest announcement or notification includes important dates like release date , last date of application submission, details regarding fees, exam timings. Candidates, check all the needs and apply accordingly.